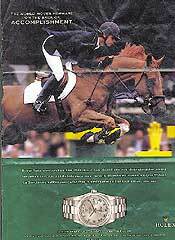 A horse is an epitome of quality, class, perfection, sometimes power. 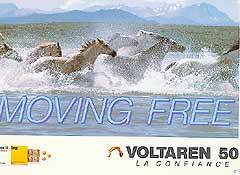 Horses also stand for freedom - or without restriction - and are in this the antipodes of Goldfish. 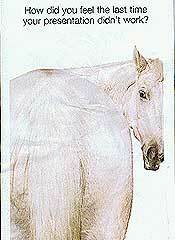 They are able to emit thoroughbred (naturally), authenticity and can impersonate Nature. That's quite a lot of positive ideas. 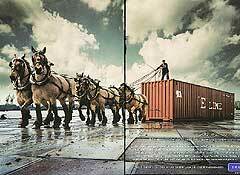 Carvendors are gladly making full use of all the qualities of horses. But they come only second after medicine brands. 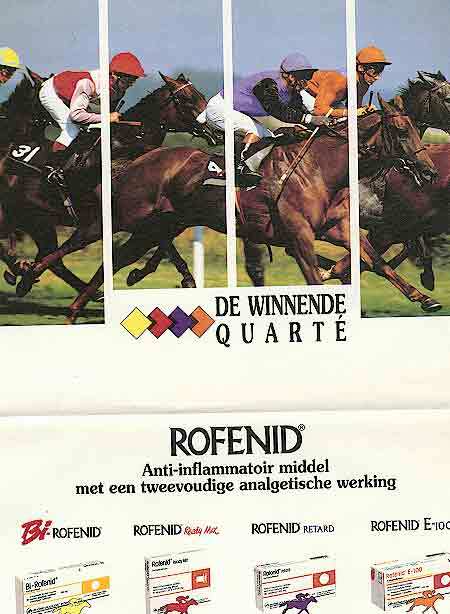 About a quarter of all adverts with horses are for some medication. 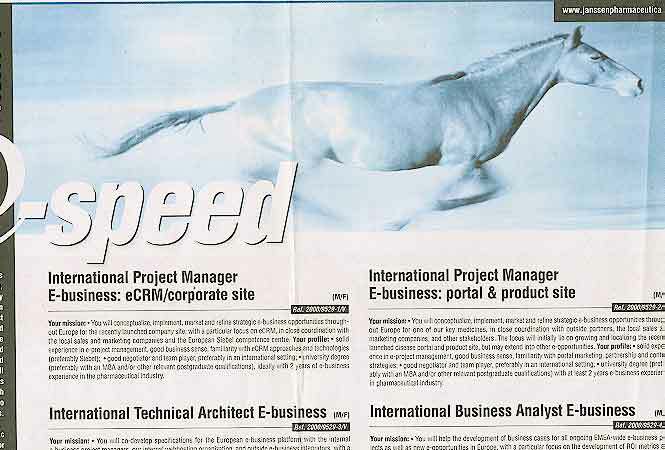 Add to that the job vacancies and we are over half of all advertisements with these noble quadrupeds. Cars are discussed in several chapters of this study. Penguins are telling us about nice high-tech features like streamline, or intelligent system controls, or air-co. Some people are dreaming of adventure, discovery or escape. They are the target of advertisements with bears and elephants. Other possible buyers are more attached to power, class, luxury, or freedom. Capturing their attention means work for the horse. Let's continue on the witty track with our first example. 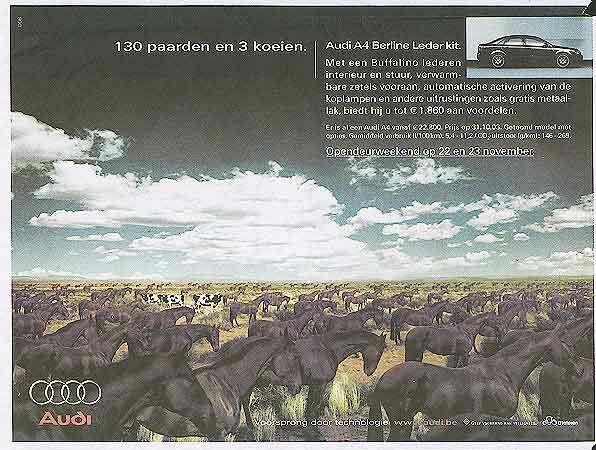 It's a car advertisement (ad 1) with the caption One hunderd thirty horses and three cows . 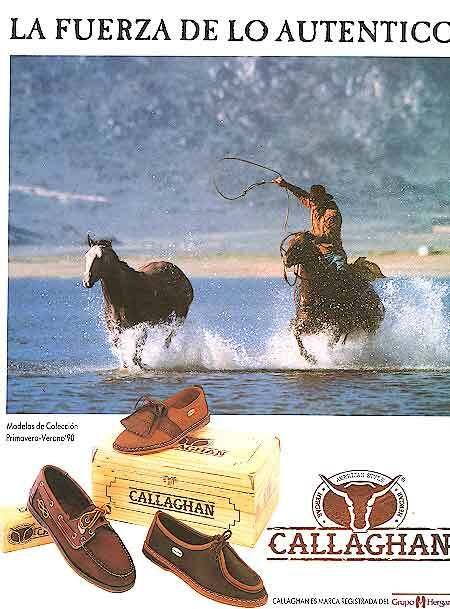 The horses stand for the power and the cows relate to the luxury of the leather finishing. 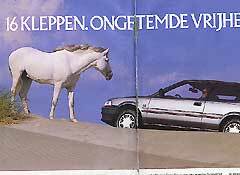 The same brand plans to repeat a previous victory in a certain car-race (ad 2). The digital montage radiates power, perseverance, class and elegance. 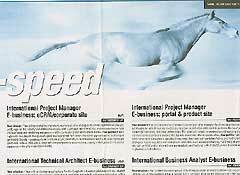 But not speed, I think. 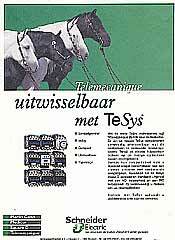 The ADSL-provider, in his series Make sure that you can act fast , mounts a lady's body on top of a pair of horse legs, but it isn't working. 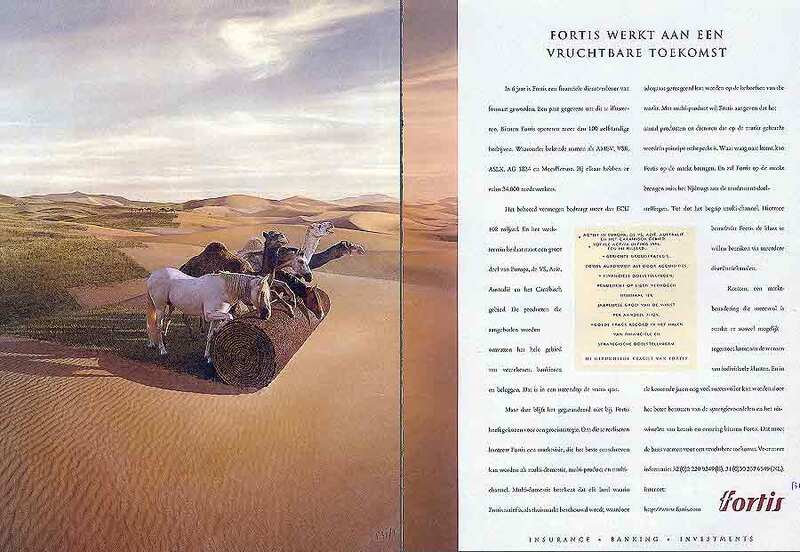 I wonder why both times a women is mounted on the horses and a man on the cat (see Zebras ad 15 and Bigger Cats ad 24). Wouldn't the reverse be more appropriate? 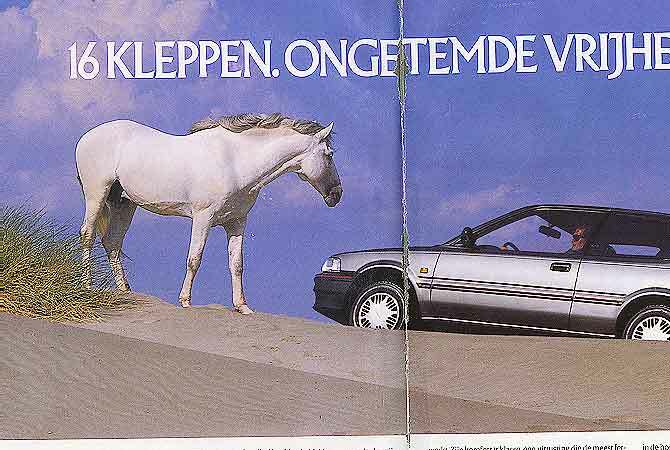 But let's get back to our cars, even to the same brand during the 1980's. 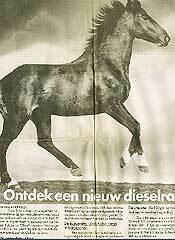 We are offered to Discover a new race of diesel engine (ad 3). The opener comes straight from the template box. 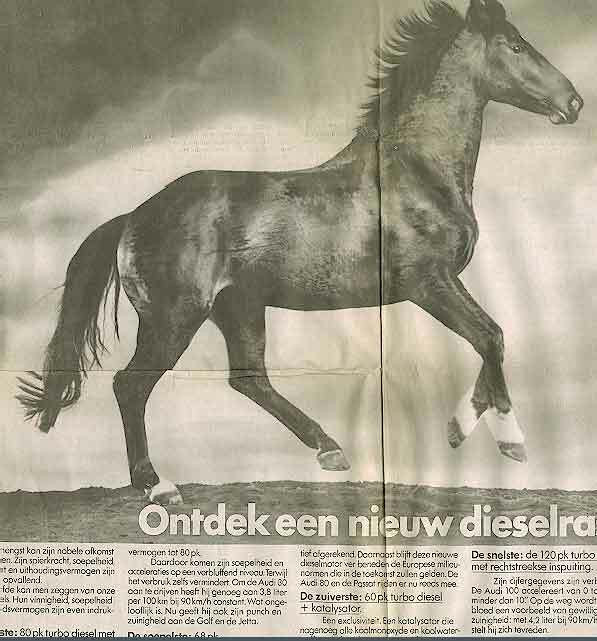 Translated from Dutch: This stallion can't obscure his noble pedigree. His muscular strength, his suppleness, his temper and his endurance are too obvious. And now comes the link with the image: You can state exactly the same about our new engines.... . The text goes on and on and tries desperately to strengthen the link with Mother Nature and follow the Green USCA handbook. There are more classy ways to advertise your car. 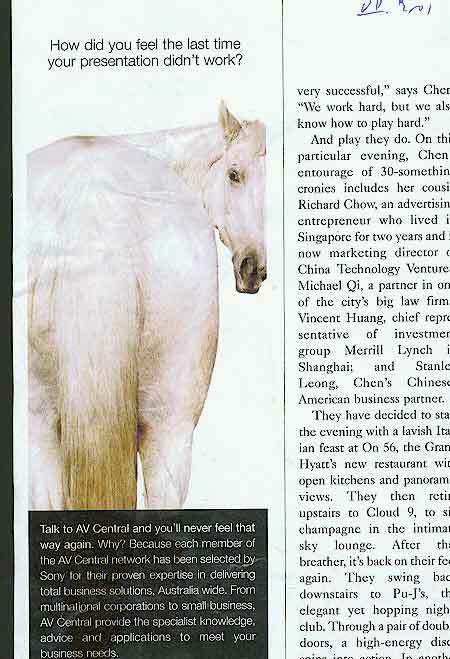 Mercedes just shows the head of a white horse. The car is reflected in the black eye. Caption: The E-class of Mercedes . Good work. 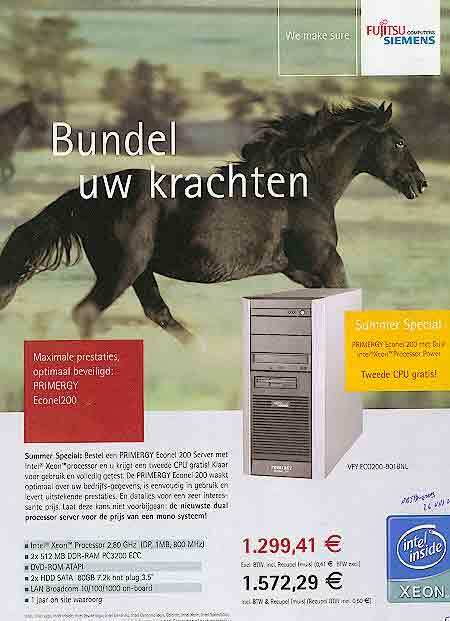 Power and speed are also important features of computers. 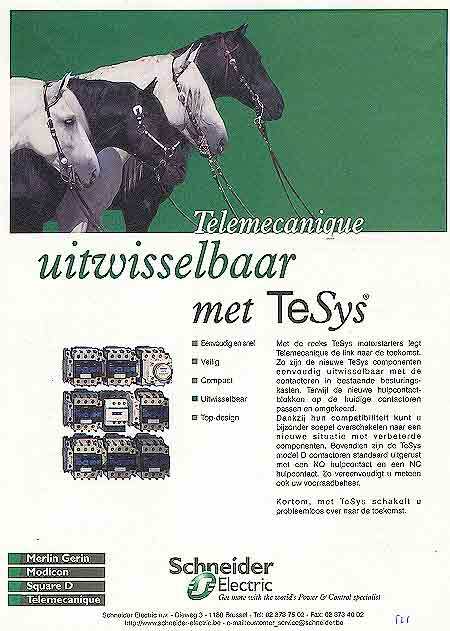 That's probably why a dual processor system (ad 16) is introduced with a horse. Not white for class, luxury and freedom, but the racing kind which will guarantee excellent performance . 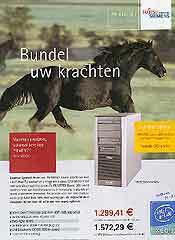 Should you mean to stress Power and Memory of computers then the Elephant is the species of choice. The concept of freedom is introduced in our next example (ad 4). The first lines sound: With 16 valves the (sic) freedom becomes reality. Each day. A daily fact. ... And then here is a long tekst with a lot of the expected vocabulary like safety, beauty, good looks , a drop of agression and style, power soft and souple ending in to let you enjoy your freedom undisturbed (notice: not without limits!). I have some difficulties to read the image - a thousand words is a lot when crammed together into one single image. But let's give it a try. Sixteen valves means power to the engine. 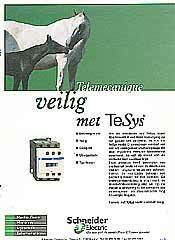 That's the link to the horse. 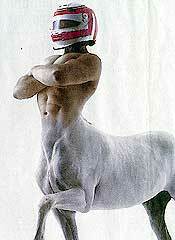 The white stallion radiates class and luxury and triggers our unconsciousness. 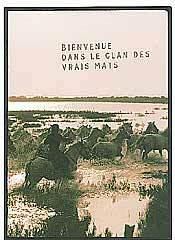 My mind promptly retrieves the trademark of the French Camargue - a bunch of white horses free to roam the vast marshes of the region - and the right mood is sprouting out (a feeling of freedom, untamed individuality, authenticity, etc.). 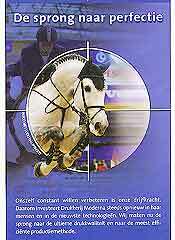 It's a popular approach, often seen with horses (e.g. ad 6, 8, 20). Freedom is the main idea also in our example 5. 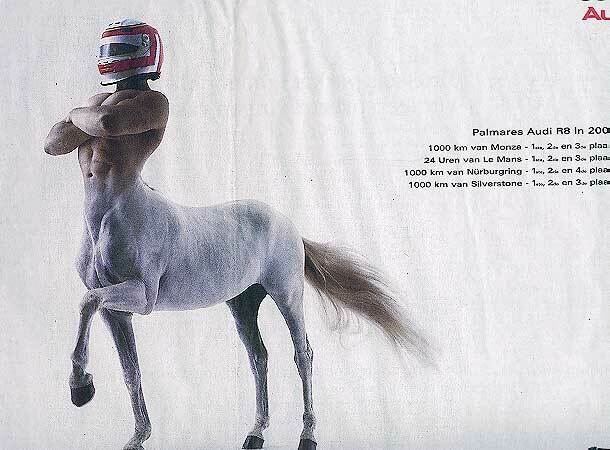 It's by far the most complex car advert I've seen until now. It's about a series of monovolumes. (a) When I was just a kid, my bike was the freedom to explore. 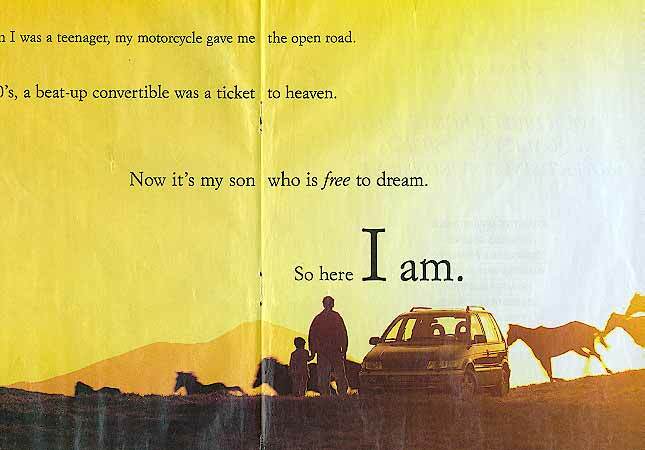 (b) When I was a teenager, my motorcycle gave me the open road. 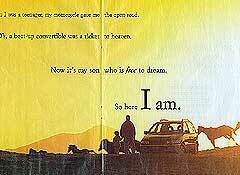 (c) And in my 20's, a beat-up convertible was a ticket to heaven. (d) Now it's my son who is free to dream. (e) So here I am. Lines (a), (b) and (c) are talking about fysical freedom, exploring a gradually growing world. But then the story switchs to the son (d) and to the mind. He is free to dream. 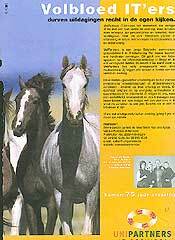 It's all underlined by the wide-plains-emotion performed by the horses. Do you feel it coming? You're are not buying this car for your egotistic self. It is an investment for your offspring. Exactly like the new encyclopaedia or luxury wristwatch. You're making (d) possible. You care (also expressed by the image; e.g. 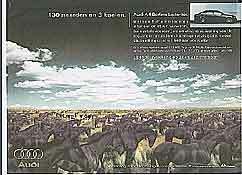 Elephants ad 13, Bears ad 20.) and pass your values (and valuables) to your children. That's why you are here (e). 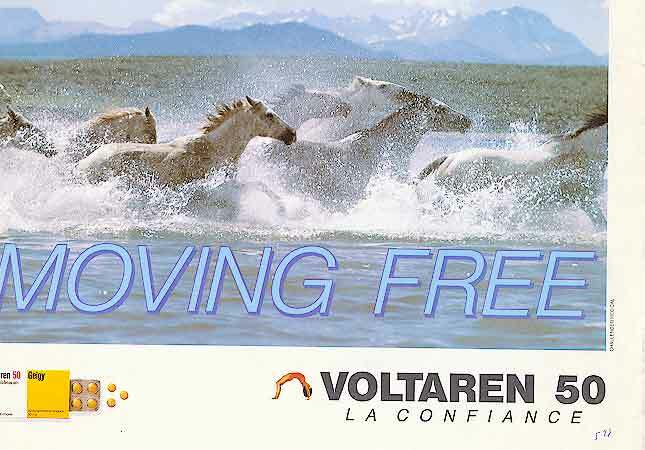 Moving free gives (by the choice of the image) the impression to talk about freedom to move without spatial limits (ad 6). The medicine is an anti-inflammatory soothing articular rheumatism, thus making movements easier and painfree. That's not what's suggested by the image. A Giraffe or a ballerina would have been a better choice. 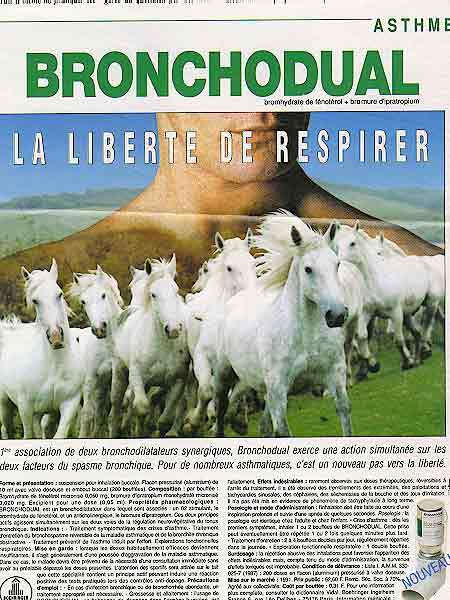 I register the same flow in the adverts for the respiratory organs (8, 9). 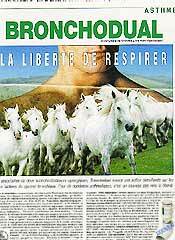 The link lies probably in the wide open nostrils of a galloping horse. I can only guess. 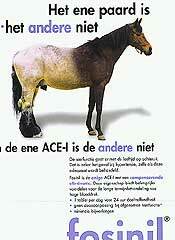 The advertisement about the hepatitis treatment (7) is also above my understanding. But I'll give it a try. The chemical is peginterferon alfa-2a. This brings us at the PEGA. Optimal usage is in combination with another product. 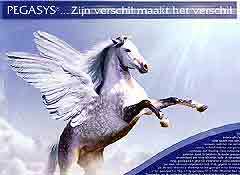 It's a system, thus PEGASYS. 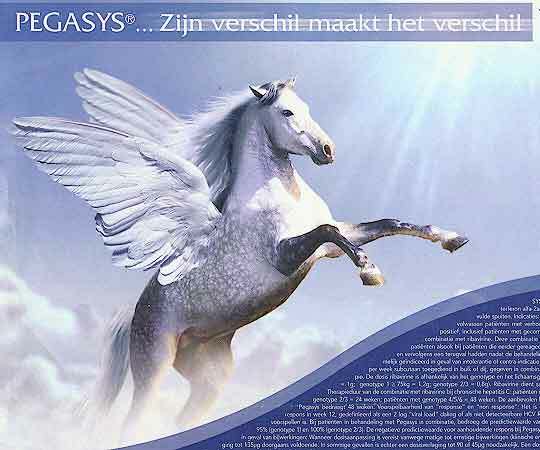 It's just a small step to Pegasus (the winged horse which sprang from the blood of Medusa). Well, it's reasonable, isn't it? But at example 10 even I am completely at a loss about the digital montage for the hypertension product. 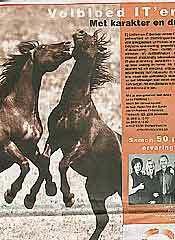 Horses, when they start jumping (ad 11 - 13), loose their connection with freedom. It's now all about reaching the top, being the best performer, delivering the best quality. That's particularly clear in both examples 11 & 12. 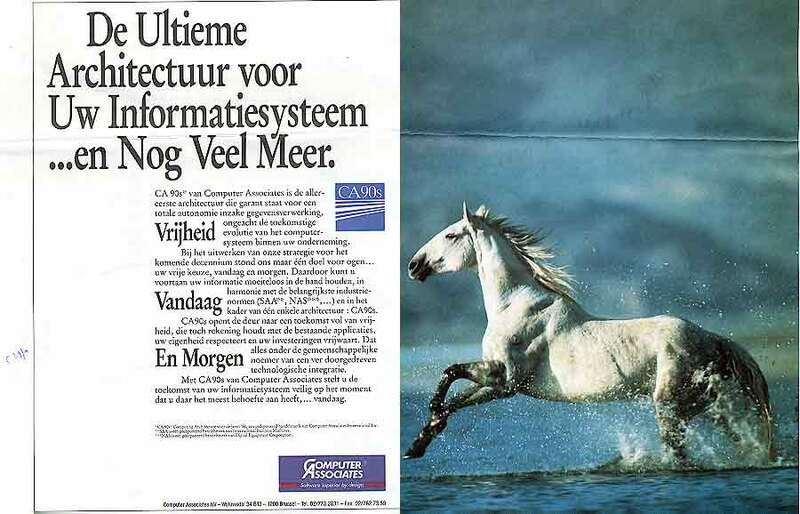 The advertisement for the printing plant (12) says The jump towards perfection. Constant improvement is our drive. 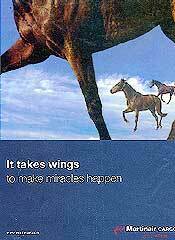 ... Now is the moment of our jump to the ultimate quality and maximum efficiency . 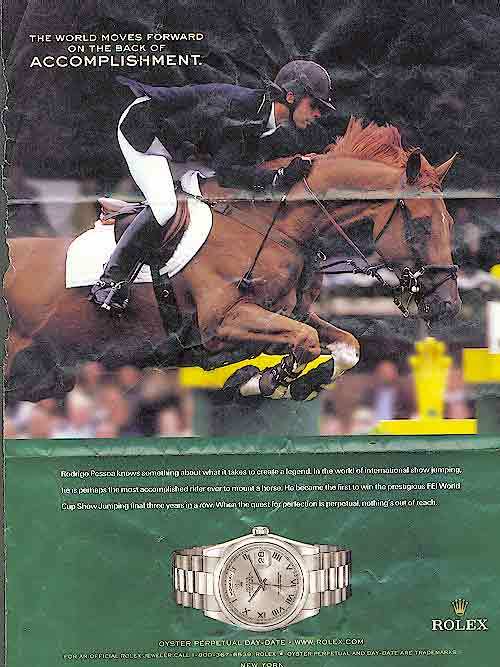 The advert for the ultimate wristwatch (11) starts with The world moves forward on the back of accomplishment. and ends with When the quest for perfection is perpetual, nothing's out of reach . 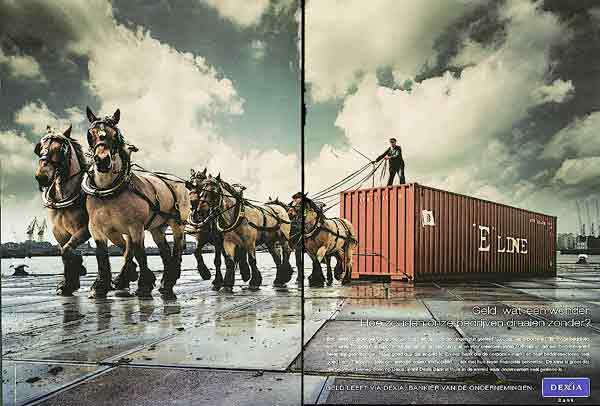 Here, the horse itself becomes kind of perfection while on other occasions it's only the carrier making the fulfillment possible. Example 11 is part of a series and not all feature this extra twist. 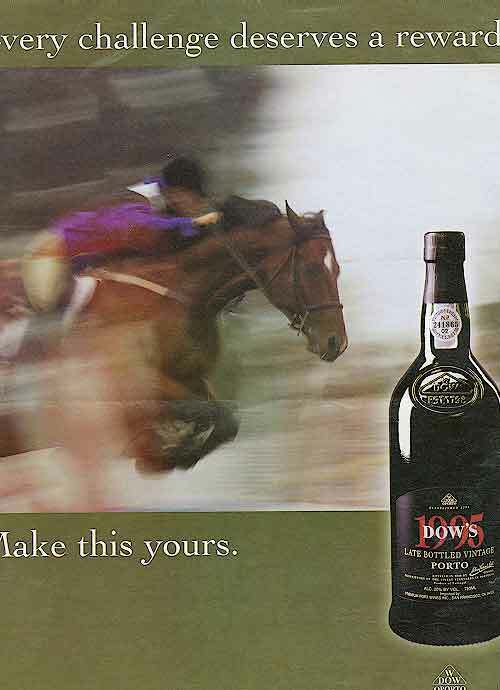 But the connection with perfection is always there, like in If perfection is a hurdle, ... .
Our last jumping horse (ad 14) comes with similar notions: challenge, jumping, hurdle and then accomplishment, reward and eventually the best quality port. 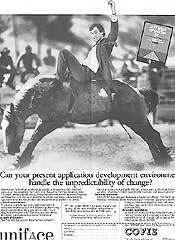 Authenticity is also one of the qualities of a horse. 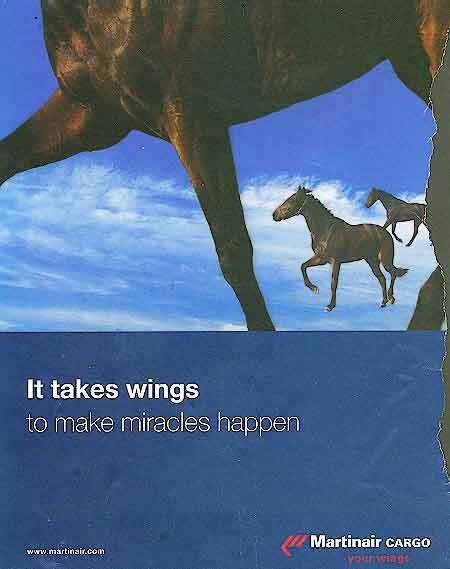 The idea is often combined with other horse emotions like freedom or perfection. Some constructions are quite simple. 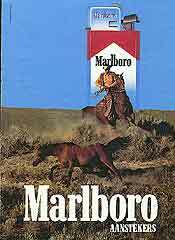 Take the advertisements for the boots (18) and cigarettes (19). 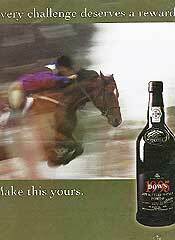 This is pure authenticity, the origins, dreaming of past times with honest products. It's a bit more complex with the boots of ad 21. 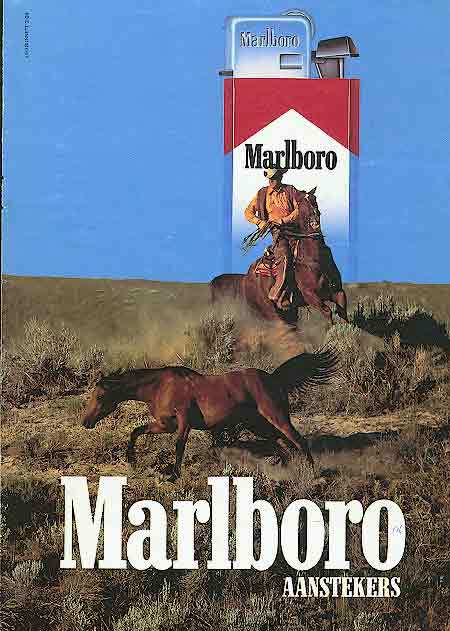 The horse probably isn't that important and at first I didn't plan to include it. 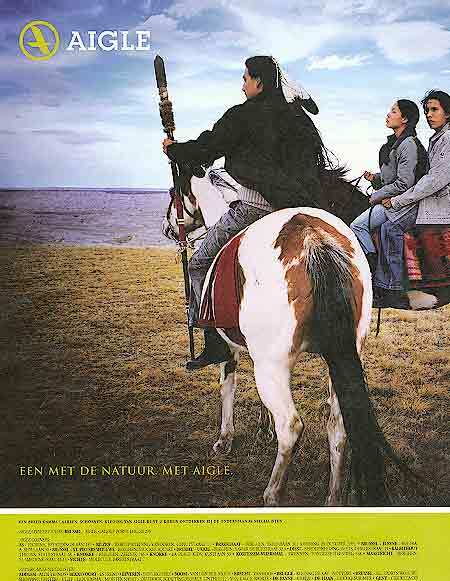 But I did because it shows how indigenous people are asked to radiate authenticity, connection with nature, freedom. It's such a nice parallel with the use of treathened animals. Read more about this in [Illustration 3]. (17) 2002 - A new step to perfection - paper (18) 1990 - The power of originals - shoes (19) 198? - A lighter as stand-in for cigarettes. 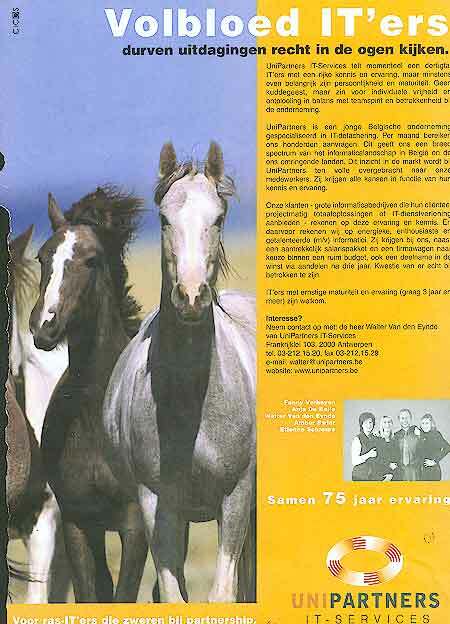 The paper stock advert (17) plays the authenticity tune ( les vrais mats ) enriched with many other classic horse tones. The image triggers for freedom (see also ad 6, 8). 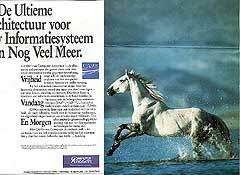 The text starts 25 centuries back in history (originals, you know) and doesn't fail to mention myth, race to perfection and gallop without constraints. 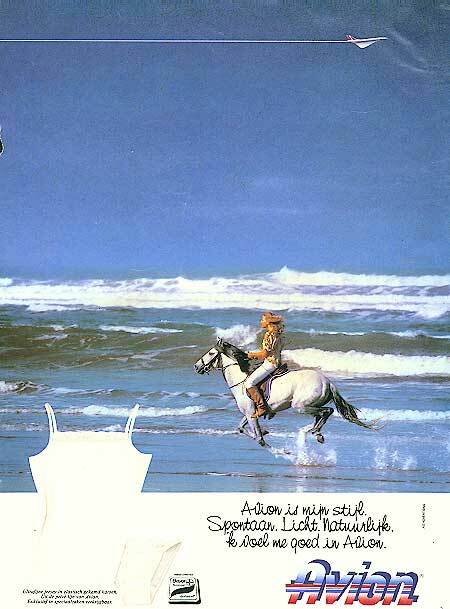 The last of this series, the underwear advert (15), is equally rich. 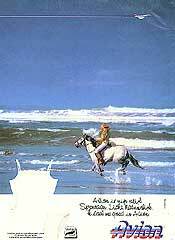 The image very suggestively features the sea with a woman riding a white horse. The text comes with spontaneous, light, natural . The brand name Avion is French for airplane. An airplane in the brand's colours is crossing the sky. 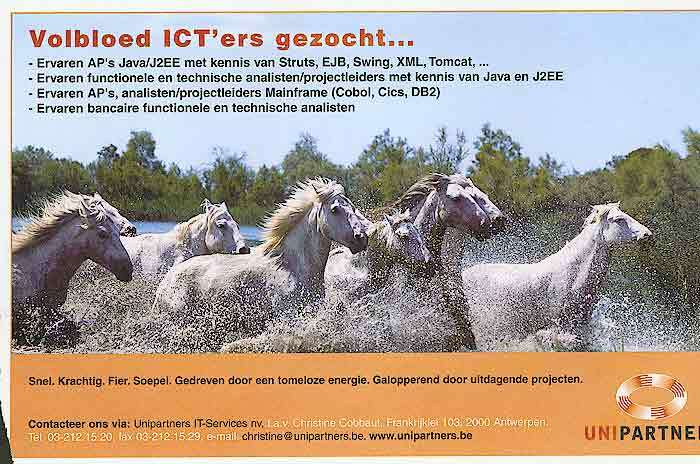 We have several job vacancies featuring horses, but they are in fact from two different companies only. 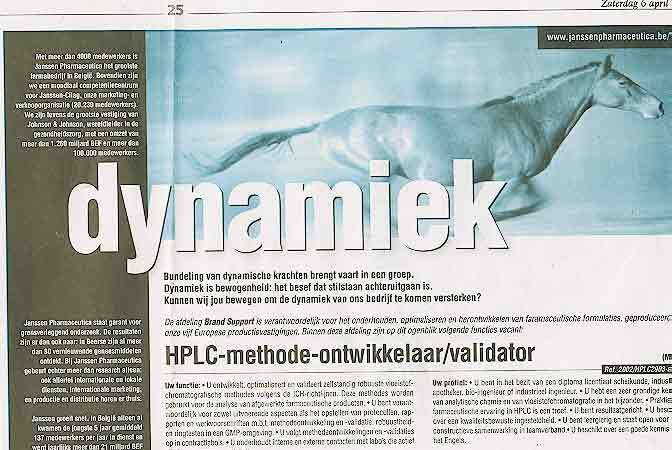 One company stubbornly sticks to Thoroughbred (20, 24, 25) and the other can't decide: Tell me, a horse, is that dynamism? Speed maybe? (22, 23). 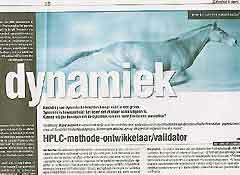 At another occasion the same company takes a Reindeer for dynamism. It's not getting any better below this lines. First two samples (27, 28) from a series about powerswitches. Ideas like top-design, fast and simple, safe, exchangeable, etc. 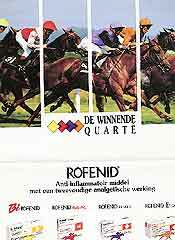 all come with one ore more horses. 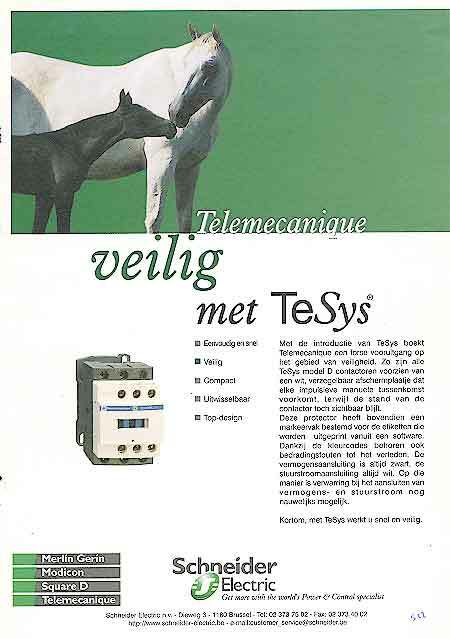 I fail to see the connection, except perhaps for the one advert with a workhorse. Working together for a fruitful future (30). 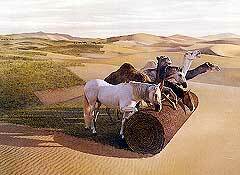 A band of camels and horses are rolling out grass over desert sand. 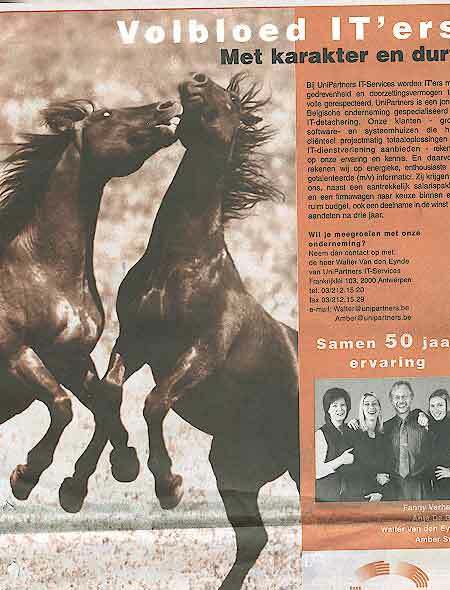 Why the horses? Because they eat grass and are the future beneficiaries? b) the scene shows the world without money (the horse is backward: negative use). 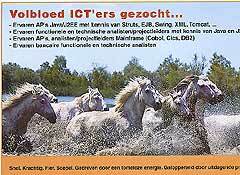 The best architecture for your information systems (32) is probably a simple implementation of the freedom-idea. 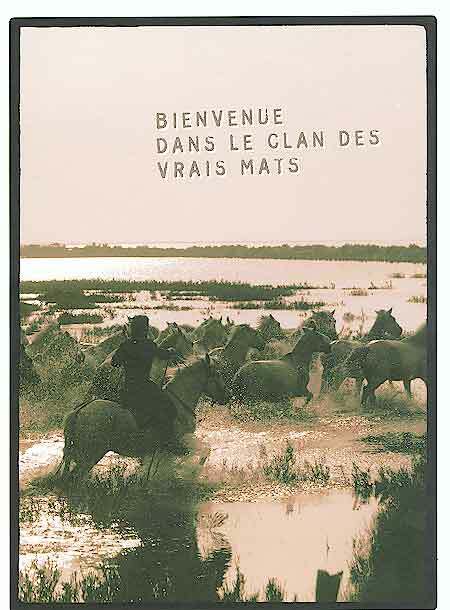 The only connection with the language of a horse is the sentence Your free choice, today and to-morrow . 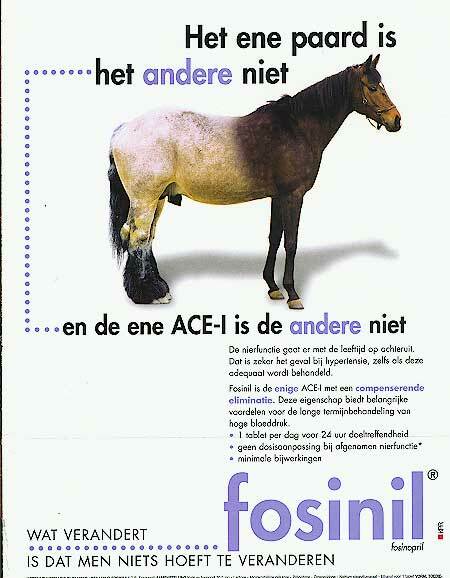 I'm closing with the exceptional approach of advertisement 29. 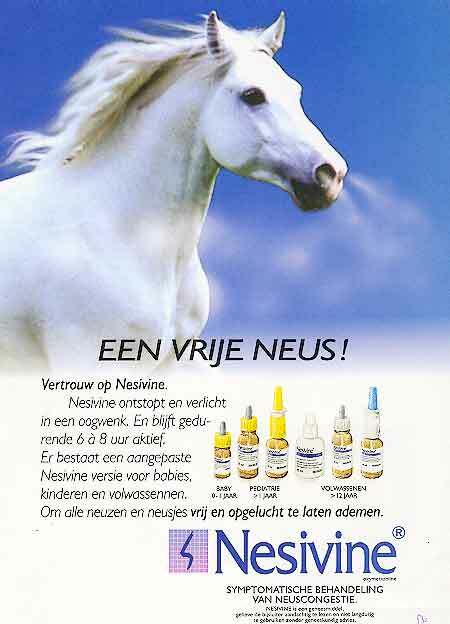 It's the only sure use of a horse with negative connotations. How did you feel the last time your presentation didn't work? . 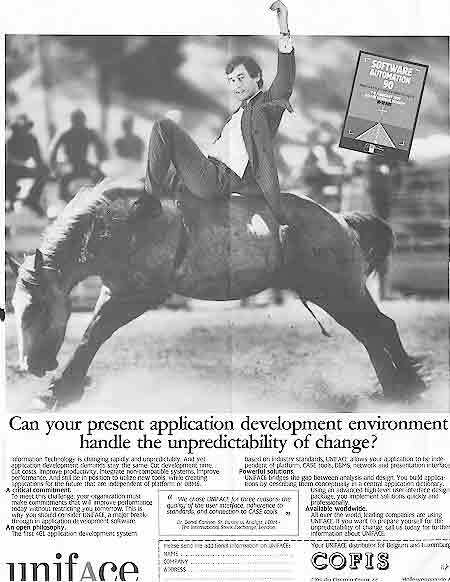 You won't feel like the back of a horse when you choose a dataprojector of the right brand.